Pop up exhibition stands have for a long time been the bread and butter of exhibition displays, and for good reason. They are lightweight, highly portable, easy to assemble, require no tools, come with a five-year hardware warranty and a host of accessories – including pop up LED lights at no extra cost. Available in any size or shape configuration, pop up stands can be adapted to suit any brand at any event. Whether it’s a shell scheme space or floor only, you are certain to find a pop up display that suits your needs; including the option of a single or double-sided pop up exhibition stand for maximum brand exposure. Pop up exhibition stands are traditionally large format displays, meaning they comprise of a wide graphic area for you to promote your business. For brands with a larger exhibition space, linked pop up display stands are the go-to option because of their enhanced size and versatility in terms of them being reconfigurable. This is a major benefit of linked pop up stands because it allows you to add to and adapt your exhibition stand when needed. Being such a large size, you might think the process of making a pop up stand is a complicated one – but it’s actually rather simple. 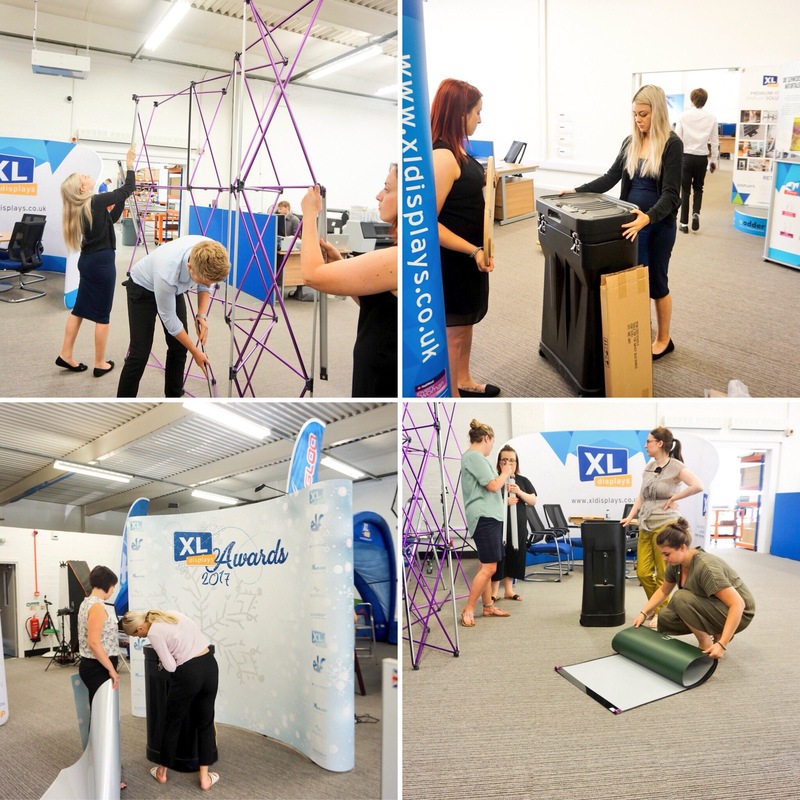 Here at XL Displays, we are the UK’s largest supplier of pop up stands and we produce hundreds each month. The growing demand for this core display product means we have perfected the craft of making high quality pop up exhibition stands in a time-efficient manner. It all starts with the sales team. They advise clients on what option is best for them according to specific needs. We train our sales team regularly so that they are up to date with the most recent knowledge on every product, allowing them to recommend the most ideal product that is fit for purpose. When an order is placed, the customer is then transferred to our graphics team. We offer a comprehensive graphic design service. Simply send in your brief and your objectives, along with any logos or images you would like including, and our graphics team will liaise with you every step of the way to create the stand you envision. If the customer already has their design ready, our graphics team will check it free of charge to ensure that it is ready for print. This means they check that the colours are compatible with the printers, the images are high resolution and the sizing is correct. When this is complete and signed off by the customer, the design then goes through to our printing department. 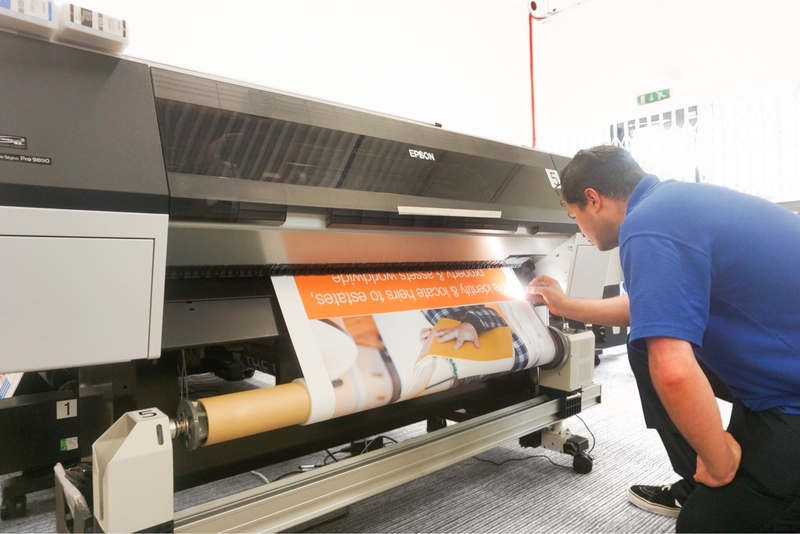 We print the graphics and check them as they come off the printer to make sure the imagery is crisp, vibrant and free of any printing errors. We also print a proof beforehand to ensure the colours are just right. When this is done, the graphic panels then go through to our production team. First of all, the production team laminate the panels to ensure they are hardwearing and durable. When the graphics are laminated, they won’t crack, peel or tear; meaning this is an essential step to ensure the longevity of the product. After lamination is complete, the graphics are cut to size and magnetic tape is added so that the graphic panels can be securely attached to the headers and kickers of the frame. It is paramount that the panels are cut to the exact size and that the mag tape is straight so that the imagery lines up neatly and stays secured to the frame. When the panels are ready, they are attached to a pop up frame as part of the test-building process. We test-build and quality check each pop up stand to ensure that the finished product is perfect before the customer receives it. When our production manager has inspected the pop up stand panel by panel and is happy with it, he signs it off. The exhibition stand is then safely packed away and sealed ready for delivery. We wrap each panel in bubble wrap so that they are protected during transportation, and the pop up frame is packed in a padded carry bag. Each panel is then placed in order of assembly inside the Zeus case and the frame is packed in another section to avoid damage. We allow 48-72 hours for this entire process, but we also offer an express service in which we can manufacture a pop up stand and get it sent out within 24 hours if necessary.